If you've been reading this blog for a while, you've probably seen my first experience with rendering poultry fat. After that success, I figured I was ready to tackle the big leagues. Target number two – beef tallow from our quarter of grass fed beef. First off, the butcher was surprised we wanted it, then doubly surprised when I said I was going to eat it myself instead of feeding it to the birds. Not everyone has caught on to the benefits of beefy goodness. “How much do you want?” said they. “Quite a bit” said I. I ended up with two rather large bags of the stuff, probably roughly equivalent to two five gallon buckets full. Here's one of them, next to a quart jar of peaches for scale. 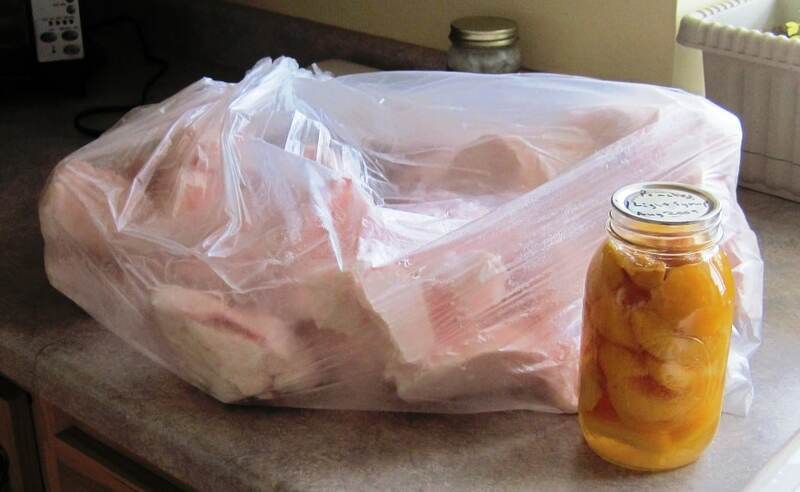 Tallow is a little different than poultry fat. Most of the references I found said it's best to process it frozen, because as it thaws it sticks to EVERYTHING. They were not kidding. It's rather strange stuff. When frozen and unrefined, the fat is very hard and the connective tissue crinkles like cellophane. As it melts, it becomes almost glue-like. I started hacking it into smaller chunks, planning to load the pieces into a hand-crank grinder like my mother had used when I was growing up. 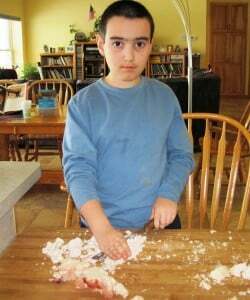 There was a LOT of tallow, so the children were drafted to help. I put the grinder together and was ready to roll, but dagnabbit! All the countertops and tables in the house were too wide to clamp the grinder on to them. What to do? I turned to my food processor, hoping it was up to the task. Alas, it made it through one pot of tallow, and then it turned no more. It was 15 years old and had been shedding strange black bits recently, so I suspected it was only a matter or time. 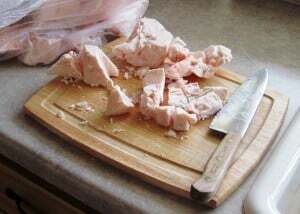 Still, this left me with no easy way to cut the tallow into small bits. “Small bits” are recommended, because they will render faster and more evenly, so you're not getting some parts burning while other parts are only half-cooked. Here's pot number one, all pink and fluffy looking. Here it is after it's started to melt down. I admit, this was a little gruesome, hot and gelatinous like some creepy critters innards. We chopped and we ground and we chopped and we ground, and I filled two 12 quart pots full plus a big roaster. 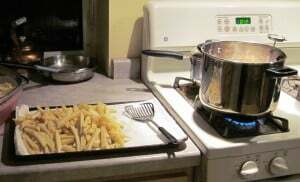 I think rendering on the stove top and in the oven went equally well, although the pot from the stove top was easier to clean. 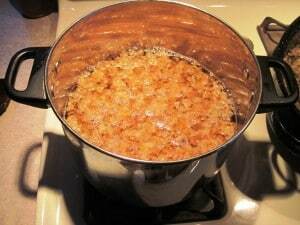 Once I got the fat cooked down to clear liquid and brown bits, I strained it through a metal strainer and let it cool in glass or metal containers. This liquid is stunningly hot, so use something sturdy on a heat proof surface. Here we have the roaster with bits and the kettle with almost done bits. 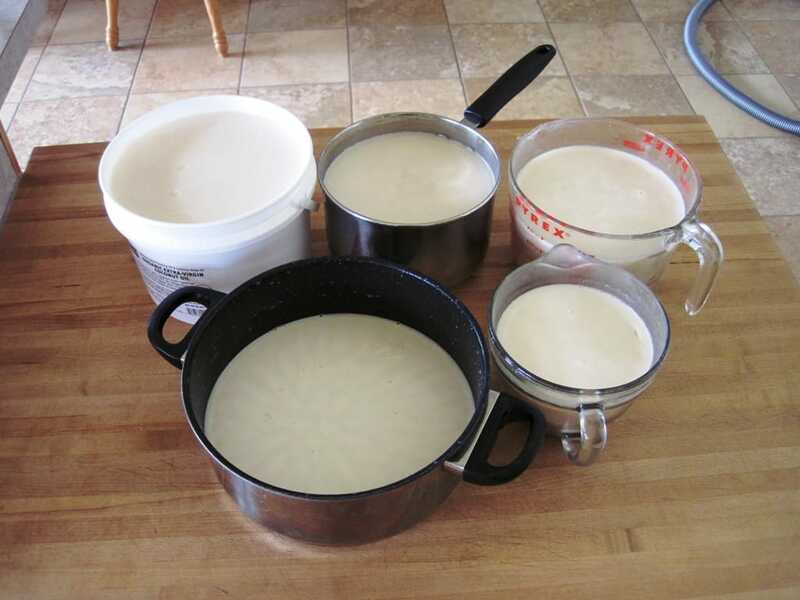 After the tallow has cooled a bit, it can be poured into food grade buckets for long term storage in the freezer. I used two gallon buckets I had saved from coconut oil and a couple other freezer containers. Here's what I ended up with before repackaging. The tallow gets REALLY hard as it cools – significantly harder than lard or coconut oil – and the clearer it is the harder it is. (We did some finger poking into different batches.) This was really a pain in the backside to do, to be honest. When the tallow was frozen, it was hard as a rock. As it started to melt, it gummed up every surface – knives, grinder, bowls – ugh! To clean it required either extremely hot water and lots of soap, or lots of elbow grease. I used a fair number of paper towels on clean up, as I was leery of clogging my pipes up with tallow fallout. 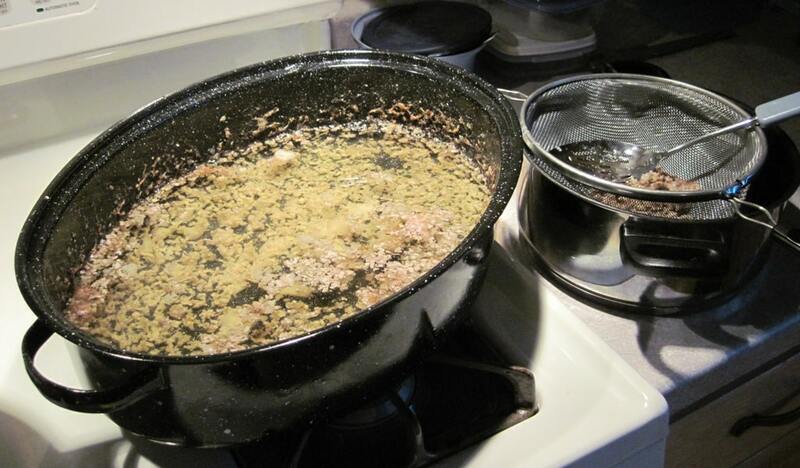 The house smelled beef for around three days, even with running the stove vent. It was mid-winter so I couldn't easily air out the house. If I had started with ground tallow it would have be so much easier, but I guess one has to live and learn. We did end up making fries, and they were pretty darn tasty, too. Beef tallow has a unrefrigerated shelf life of 2-6 months, depending on temperature and degree of impurities. I keep mine in the refrigerator (9-12 months) or freezer (1-2 years) for extended storage. 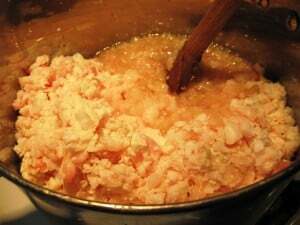 How long did it take for the tallow to render on the stove? We have friends that will be turning out 2-3 grass fed beef, lamb and chickens this summer. So hoping we can afford to buy from them. I'm a bit out of the loop with my postings lately. So busy with knitting for Grand Baby due in April, but shower is in 1 1/2 weeks. Shower took us by surprise, just announced a week ago and we were under the impression that our daughter in law was firm on no shower..someone apparently changed her mind. Had some delays now with my knitting due to hurting my back last weekend hauling firewood in. Knitting slowed down to heating pad therapy and dosing off with the heat. Have to bind a faux sheep fleece blanket for the baby, also….though I'll do a posting about it all when I do get done. By the way I love the look on your sons face chopping tallow…just to cute!! Tami – a couple of hours? I didn't time it exactly. We started in the early afternoon and I finished cleaning up the last of the mess around 10pm. We had to stop and I ran and got the grinder,and I stopped and made dinner. I finished up the last pot full on my own after dinner. Wow! This is great! Thanks so much… I blog at Just Making Noise. I see you have pretty much all my favorite blogs on your blogroll too! What a lot of gross work, but now you're done for a while! WTG. Hi Marillyn! I'll be taking a peek at what you're up to. 🙂 Isn't the internet handy? motherhen – yep! I ended up with close to three gallons of tallow, so we should be well set until next fall. Guess what? 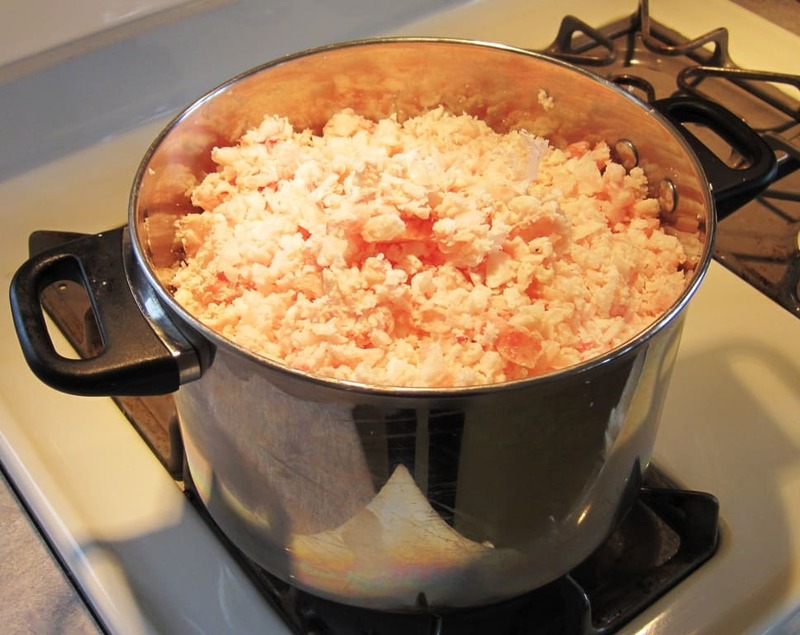 You just got your second Beautiful Blogger Award..
I’ll be picking up about 30 pounds of tallow at the butcher’s on Tuesday….it’ll be my first time trying to render fat on this scale. :o) Of course, the first place I thought to look for instructions was here. Thanks! thanks for thinking of me! Give yourself plenty of time to tackle that much tallow. Your hands are going to be so soft by the time you’re done! Could you use a crock pot? Yes, just make sure there is ventilation. Rendering tallow will produce a very distinctive beefy smell.